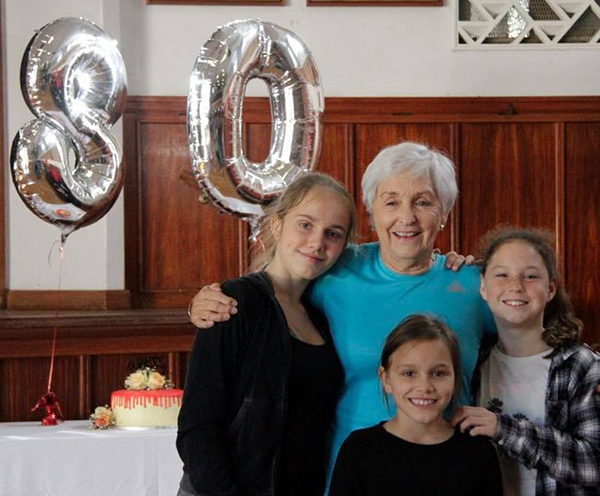 We Celebrate as Pikkie Turns 80! I thought it would be nice to give a little history of Pikkie’s life and to show how her early choices in life steered her towards the Fitness League. Mom was born in Springs in Gauteng. Her Dad, my grandfather, was a geologist working in the South African gold mines. Her childhood, with her 2 brothers and a sister, was a happy one even though they moved often due my grandfather’s job. She completed her schooling at Springfield convent and thereafter enrolled in a course at UCT Ballet school with the aim of becoming a ballet teacher. Unfortunately, after only one year at UCT, her father was transferred to the Ashanti Goldfields offices in London. Once there, she enrolled in a 3 year diploma at the London College of Dance and Drama which was a huge highlight for her. She loved her time there studying all types of dance from ballroom to tap, folk to modern dancing, Greek dancing to ballet. Interestingly, her favorite subject during her time there was a subject called ‘natural movement’. Many years later when she was introduced the to the Fitness League…it was the similarity of the movements of the league that brought to life the memories of her ‘natural movement’ course and so piqued her interest in the league. Her last two years at the London College of Dance and Drama, went by in a flash with her dedicating all her time and energy into learning everything she could about dance. In her 3rd year she was named ‘head student’ and finished the course with great praise. Still to this day, Mom’s knowledge of different types of dance styles is amazing and many of you will have experienced her incredible choreographic skills and diversity in her classes and movement classes. Her love of music, her creativity, her understanding of natural movement and her incredible musicality have been the cornerstones of her dance fitness classes over the years…and this is where it all stemmed from. Once her course in London finished, she, and two friends, traveled to Toronto Canada where she met up with my dad again, they got engaged, married and Toronto became their home. She then opened her own ballet school called the ‘Patricia Power school of dance’. She ran that successfully for a few years until the call of the African sun became so strong that they knew they needed to head back. Young, happy and carefree, mom and dad settled back into Cape Town where family life became their priority raising 4 kids. It was while we were young (my brothers still in nappies), that she discovered this organization – then called the Women’s league of health and beauty which had originated in England in 1930’s and brought to SA by Prunella Stack and Barbara Keys. They wore black satin pants and white satin tops and they learnt a series of rhythmic movements to music which energized and strengthened the whole body. Mom started attending Barbara’s classes while in her late 30’s where she was captivated by the beautifully graceful movements of the Bagot Stack system which focused on gentle movements and perfect posture. Mom loved it and soon was approached by Barbara to do the teacher training … over the next 40 years she partnered with Barbara in running the league in South Africa. Some of her members who joined all those years ago are still with her today, attending her classes week in and week out. She keeps involved and passionate about the fitness league, always the first to implement new ideas and innovation into her classes.